Bunting, Eve. I Love You, Too! Illus. by Melissa Sweet. Scholastic, 2004/2016, 24p. $7.99, 978-0-545-81390-7. Various animal children (and one human boy) give their mamas gifts in this story enhanced by repetition and rhyme. The lilting text, lovely watercolor artwork, and common events in the narrative add up to a relatable board book for babies, toddlers, and their parents. This oversized board book doesn’t lose anything in this format. Clement, Nathan. Drive. Boyd Mills, 2008/2016, 32p. $7.99, 978-1-62979-692-5. A young boy describes his “Daddy’s” job – he is a long haul truck driver. The informational text is paired with realistic paintings that appear to be airbrushed. The board edition works fine one-on-one, and the picture book version would be good for a Father’s Day storytime. Cousins, Lucy. Peck, Peck, Peck. Candlewick, 2013/2016, 30p. $8.99. 978-0-7636-8946-9. A woodpecker describes how his dad taught him how to peck in this lively rhyming tale. He pecks through a door and then pecks holes in various items in the house; each page features actual die-cut holes. Cousins’ signature deeply saturated painted illustrations work well with the text in this oversized board edition; this would be great for a bird-themed storytime. Geist, Ken. The Three Little Fish and the Big Bad Shark. Illus. By Julia Gorton. Scholastic, 2007/2016, 22p. $6.99, 978-0-545-94483-0. Although the text and brightly colored cartoonish illustrations make for crowded pages, this spoof of “The Three Pigs” will propel preschoolers into fits of laughter. Because of the busy page design, this is best used one-on-one. A wide age range will appreciate the humor in this successful parody. Holub, Joan. Mighty Dads. Illus. by James Dean. Scholastic, 2014/2016, 30p. $6.99, 978-0-545-89036-6. 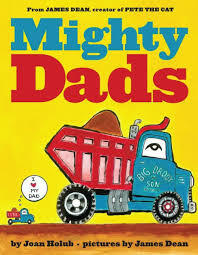 These “Mighty Dads” are all vehicles, including dump trucks, bulldozers, cement mixers, and steamrollers. The brief, rhyming text describes the main activity each vehicle can do, using onomatopoeia, and the full color artwork is bright and fairly realistic to each machine. The subject matter, artwork, and text will interest babies and toddlers, so this board edition will certainly be popular. Lichtenheld, Tom. Cloudette. Holt, 2011/2016, 30p. $7.99, 978-1-62779-501-2. A little cloud is blown from the city to the forest by a huge storm in this sweet story on perseverance. Although the text is a little long for a board book, the story is very compelling and the cartoon-like illustrations are equally pleasing. A fine tale for demonstrating that even someone small can make a big impact when needed. Raposo, Joe. Sing…Sing a Song. Holt, 2013/2016, 32p. $8.99, 978-1-62779-502-9. Most young children and parents will know this song from “Sesame Street,” and will sing along even though the sheet music isn’t included in this board version (it is in the hardback). The watercolor artwork is very helpful in setting the tone, from the beginning wordless spreads to the final pages of birds. The Spanish lyrics are on the last page. The picture book version is better for storytime. Swinburne, Stephen R. Whose Shoes? A Shoe for Every Job. Boyd Mills, 2010/2016, 32p. $7.99, 978-1-62979-691-8. Full color photos highlight this delightful look at occupations. After a few introductory sentences and photos, the main text begins by asking the title question. Turn the page and see the answer with a photo of a ballerina, firefighter, chef, etc. The repeated question and answers will invite children to participate. The picture book version is perfect for storytime and the board version is great for one-on-one sharing; the culturally diverse people in the photos are a plus, too. Tankard, Jeremy. Grumpy Bird. Scholastic, 2007/2016, 30p. $6.99, 978-0-545-87182-2. Grumpy Bird is so grumpy he decides to walk everywhere, and is soon followed by several other animals. The narrative would be great for storytime, with the repeated phrase “What are you doing?” and the fact kids can guess each animal as they appear. The artwork really stands out due to its originality. The full color illustrations feature thick black outlines and unique backgrounds with flowers and prints of tree trunks. Highly recommended. Tillman, Nancy. I’d Know You Anywhere, My Love. Feiwel, 2013/2015, 32p. $7.99, 978-1-250-07292-4. More for parents than for children, Tillman’s books celebrate a parent’s love for a child. In this story, the mother in red describes how the child will be recognized even if the child turns into an animal. The rhyming text is a little long for a board book, and printed in a very small typeface. The painterly illustrations are quite detailed, so they also work better in the picture book version, so stick with that. Vestergaard, Hope. Digger Dozer Dumper. Illus. by David Slonim. Candlewick, 2013/2016. $7.99, 978-0-7636-8893-6. Fourteen rhyming poems about vehicles are collected in this board edition; the original hardback is preferable as these are too long for the toddler audience. Using relatively small print, most of the poems are eight lines or more. The cartoonish acrylic and charcoal artwork is very appealing but the poems are best understood and enjoyed by children old enough to attend school. Wan, Joyce. The Whale in My Swimming Pool. FSG, 205/2016, 32p. $7.99, 978-0-374-30188-0. 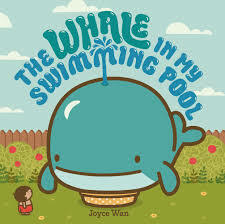 A little boy (who appears to be Asian-American) wants to swim in his wading pool but a HUGE whale is in it (or more accurately, lying on top of it). The dialogue from the boy makes up most of the text and adds humor (“I’ll give you my allowance.”); the cartoonish artwork is equally pleasing and funny. This will engage parents and kids. Yuli, Toni. Night Owl. Feiwel, 2015/2016, 32p. $7.99, 978-1-250-07291-7. The title character awakes but cannot find his mother. The story is similar to Martin Waddell’s superior book Owl Babies (Candlewick, 1992), and has repetition, but isn’t as memorable. The deeply saturated artwork is dominated by black and dark blue, and has a nice child-like quality. Good for one-on-one sharing. Zimmerman, Andrea, and David Clemensha. Digger Man. Holt, 20013/2016, 30p. $7.99, 978-1-62779-444-2. A little boy describes how he plans to own a “digger” machine (a bulldozer although that term is never used), and use it to build things. His baby brother rides along on the imaginary journey, while the boys are pictured playing with a toy bulldozer. Full color acrylic artwork and a very brief text make this a great choice for toddlers who love big machines. Collicutt, Paul. This Plane. FSG, 2000/2016, 28p. $7.99, 978-0-374-35987-4. Collicutt, Paul. This Train. FSG, 1999/2016, 28p. $7.99, 978-0-374-37719-9. Babies and toddlers are fascinated with vehicles, so these picture book adaptations should be popular in the board format. Full color paintings of various trains and planes are accompanied by very brief informational sentences: “This train uses two rails. This train uses one rail.” The endpapers show all the vehicles along with their name and country of origin, such as “Boeing 247 (USA).” A great way to introduce informational books to toddlers. Eaton, Jason Carter. How to Train a Train. Illus. by John Rocco. Candlewick, 2013/2016, 28p. $7.99, 978-0-7636-8899-8. Originally a picture book, a boy describes how he trained a train, similar to training a pet; for example, he teaches the train to fetch. But the longer text and detailed full color illustrations, along with the somewhat sophisticated sense of humor one needs to appreciate the joke, work much better as a picture book. This will be lost on the usual board book audience of babies and toddlers. There is a sequel: How to Track a Truck (2016). McCourt, Lisa. You Can Do It, Stinky Face! Illus. by Cyd Moore. Scholastic, 2016, 32p. $6.99, 978-0-545-90592-3. McCourt, Lisa. Good Night, Stinky Face. Illus. by Cyd Moore. Scholastic, 2016, 32p. $6.99, 978-0-545-90592-3. The earlier “Stinky Face” books were picture books, but now McCourt is creating new board books using the character of a little Caucasian boy who is called Stinky Face. The narrative involves the same question and answer dialogue that the parent and child demonstrate in Margaret Wise Brown’s classic The Runaway Bunny. For example, Stinky Face asks what would happen if he wanted to draw the most exciting picture ever? His mom responds she would get out all the art supplies. The story is too long and the pictures too detailed for the board book format; plus, the story is not very original. Skip these. Steers, Billy. Farm Days. (Tractor Mac series). FSG, 2012/2016, 16p. $5.99, 978-0-374-30117-0. Tractor Mac and the farmer that drives him prepare the soil and plant hay in a book with somewhat complex vocabulary. Originally published as a picture book, this is best suited to older preschoolers. The watercolor and pencil artwork is pleasant but too detailed to use in a group setting.